Just got back from Southwest Wisconsin. Sorry I did not blog while we were there. No access to the Internet at the cabin. Only had access at this wonderful little ice cream place in Westby, WI. Anyway - check this out. I was on my way to one of my favorite spots on the West Fork of the Kickapoo when I spotted this family way out the pasture. 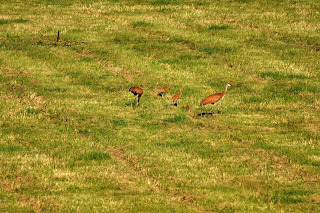 I had never seen baby cranes before. These guys were a long way off. So I pulled out my 300 and the TC1.4 and took aim. Not the greatest pictures - but it always pays to have your camera with you. Perhaps this couple was in NE on the Platte River with me and Moose.